Grass spiders are very common in Pennsylvania and can be recognized by the large, somewhat concave, mostly horizontal, sheet-like web with a funnel or tunnel located off to one side. The webs are found on grass, weeds, and ground covers such as ivy, pachysandra, or periwinkle, and in numerous exterior places such as fencerows, bushes, and brush piles. Homeowners frequently see these fast-moving spiders indoors in the autumn as the spiders seek protection from falling temperatures. Grass spiders can be identified by their distinctive webs, the dorsal markings on the carapace and abdomen, and the greatly elongated hind spinnerets. 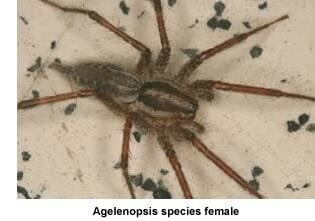 Females are from 10 to 20 millimeters and the males from 9 to 18 millimeters in length. The carapace is yellow-brown to brown with a pair of darker, longitudinal bands extending back from the lateral eyes, and another pair of very thin lines located one on each side of the carapace. The abdomen is generally darker than the carapace and has a lighter median band, sometimes with a scalloped edge. The legs are frequently annulated, darker at the distal ends of the segments. The female deposits a lens-shaped, white egg sac in the late summer to fall. The eggs hatch in the spring and, after a series of molts, become adults in late summer. Although it is common to find these spiders entering structures in the fall, the adults do not overwinter. As previously mentioned, the webs are found in many locations and serve as both a platform on which the spider captures prey and as a retreat in which the spiders can remain hidden. The grass spider web is not sticky but relies upon a network of threads above the sheet to divert or impede insect flight, causing them to fall onto the sheet, where they are captured by the rapidly running grass spider. These spiders are extremely fast and shy. Consequently, very few people are bitten. Their bites have been reported to cause pain, swelling, redness, and itching and duration of symptoms ranging from 1 to 10 days but without serious consequences.